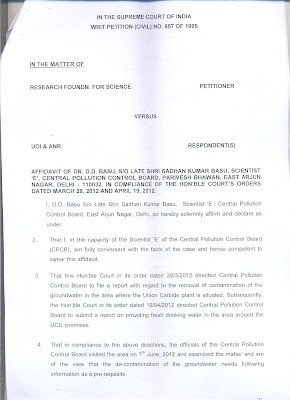 This is with reference to the attached 13 page affidavit of CPCB in the matter of drinking water in Dow Chemicals Company's Union Carbide Corporation (UCC)’s Bhopal plant area filed in Hon'ble Supreme Court on July 17, 2012, news report “What’s holding back Bhopal water report?”, my letter dated July 14, 2012, assurance of Shri Vijay Panjwani and court's order dated March 28 and April 19, 2012. 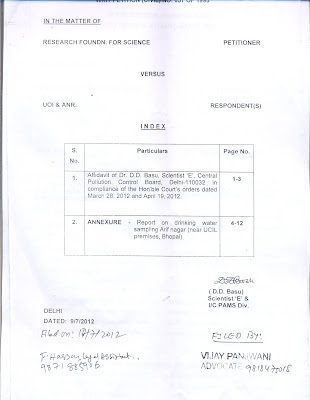 I submit that the bench of Hon’ble Justice Altamas Kabir and Justice J. Chelameswar had directed, “The Central Pollution Control Board, which has been added as party to these proceedings, and represented in Court today, shall also file a report with regard to the removal of contamination of the ground water in the area where Union Carbide factory/plant is situated” on March 28, 2012 in I.A. No.43 of 2007 in Writ Petition (Civil)No. 657 of 1995. The court in its order dated April 19 has directed, “the Central Pollution Control Board is given time to file its composite report by 4th June, 2012.” Both the orders are enclosed. 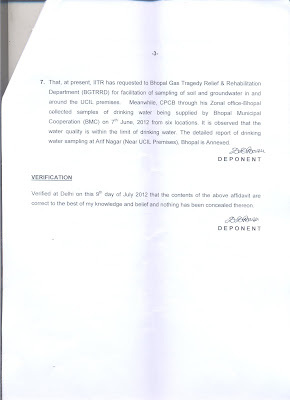 I submit that at page 2 of the affidavit filed by Dr D D Basu reads: "the officials of the Central Pollution Control Board visited the area on 7th June, 2012 and examined the matter and are of the view that the de-contamination of the ground water needs following information as a pre-requisite. Status of water quality of the ground water in the formal UCIL premises, Bhopal. To what extent with respect to area, the ground water is contaminated. 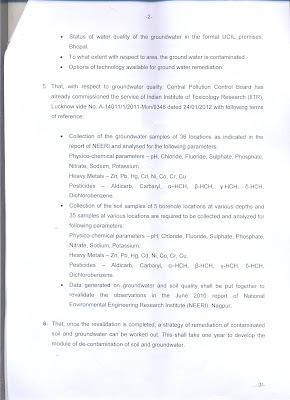 Options of technology available for ground water remediation"
I submit that at page 3 of the affidavit it is stated that "with respect to ground water quality, Central Pollution Control Board has already commissioned the service of Indian Institute of Toxicology Research (IITR), Lucknow vide No. A-14011/1/2011-Mon/9348 dated 24/01/2012..."
I submit that two out of three the Terms of Reference (TOR) for IITR mentioned in the affidavit reads: "Collection of the ground water samples of 36 locations as indicated in the report of NEERI and analysed for the following parameters...:" and "Data generated on groundwater and soil quality shall be put together to revalidate the observations in the June 2010 report of National Environmental Engineering Research Institute (NEERI), Nagpur." It may be noted that NEERI study's assumption of direction of flow of ground water in the UCC's plant area has been contested. Both these TORs appear motivated as it appears to decide the direction and inference of the IITR study. It is also sad that instead of acting as per Hon'ble Court's order, the affidavit refers to a business as usual study that was commissioned to IITR as per its letter dated January 24, 2012 that seems to task IITR to ensure compliance with NEERI's study. This study is not in compliance with the Hon'ble Court's order dated March 28, 2012 because it was commissioned 2 months prior to the order. It further states that "once the revalidation is completed, a strategy of remediation of contaminated soil and ground water can be worked out. This shall take one year to develop the module of decontamination of soil and ground water." It is revealed that "IITR has requested to Bhopal Gas Tragedy Relief & Rehabilitation Department (BGTRRD) for facilitation of sampling of soil and ground water in and around the UCIL premises." 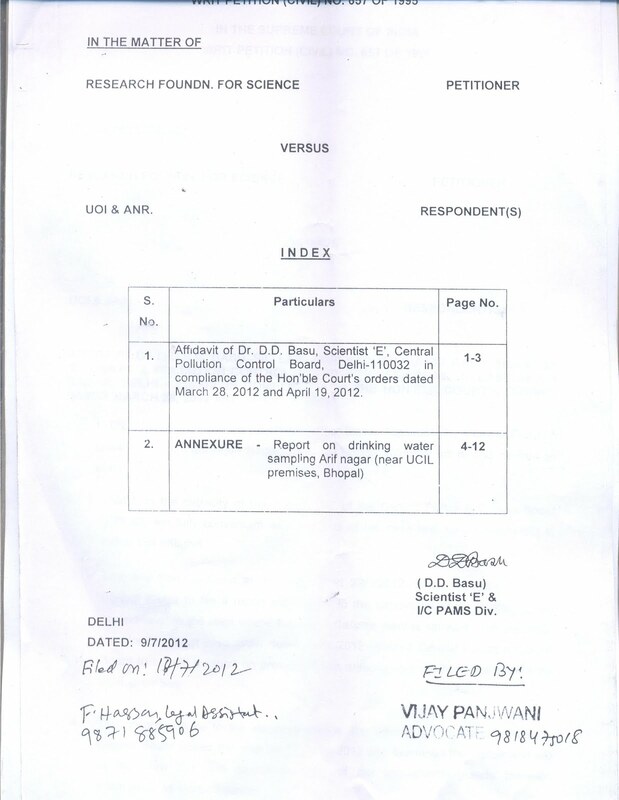 I submit that it is clear from these above admissions in the affidavit that the "report with regard to the removal of contamination of the ground water in the area where Union Carbide factory/plant is situated" as directed by the Hon'ble Court is not yet complete and only correspondence with regard to the same has happened. I submit that the concluding sentence of the affidavit at page 4 reads: " Meanwhile, CPCB through his Zonal Office-Bhopal collected samples of drinking water being supplied by Bhopal Municipal Corporation (BMC) on 7th June, 2012 from six locations. 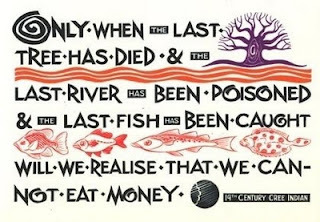 It is observed that the water quality is within the limit of drinking water". 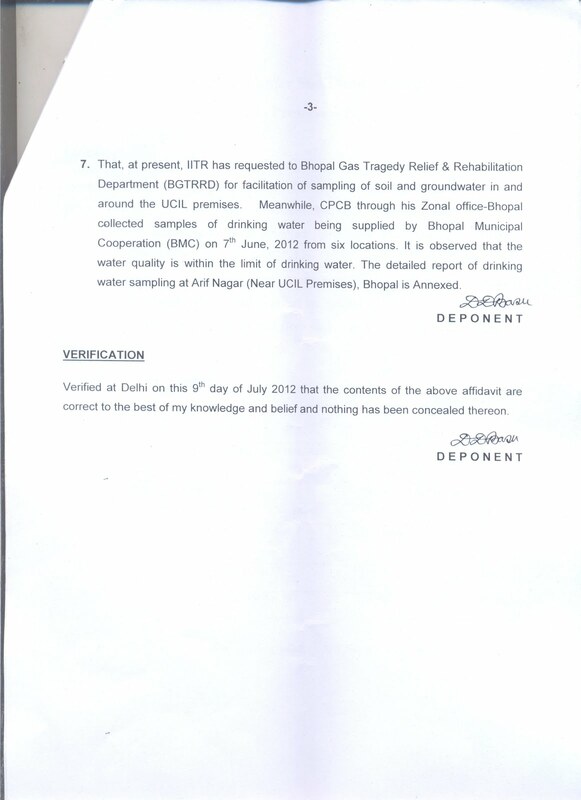 It concludes by saying that " The detailed report of drinking water sampling ar Arif Nagar (Near UCIL premises), Bhopal is Annexed." 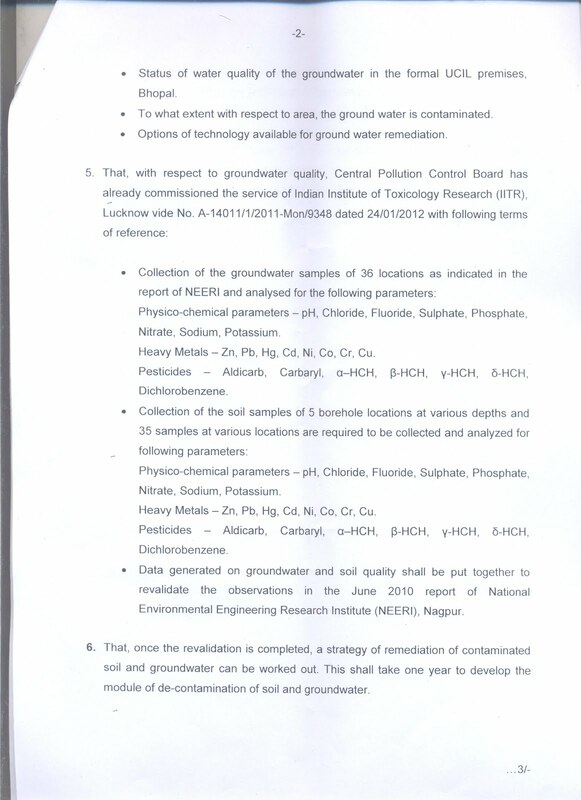 It is evident from what is mentioned at page 2 of the affidavit that CPCB was directed to examine contamination of ground water in the are where UCC factory is located. But after admitting that the examination is not yet complete, CPCB undertook the formality of testing samples of BMC's drinking water supply and casually talks about how "possibility of cross contamination" with dirty water "cannot be ruled out" at page 7 (in the annex) of the affidavit. There is reference to "one sample from bore well being used by a local small restaurant (Ayasha Hotel)." The pagination of the affidavit is irregular that gives an impression that some pages of the annexure may be missing or may have got left out. 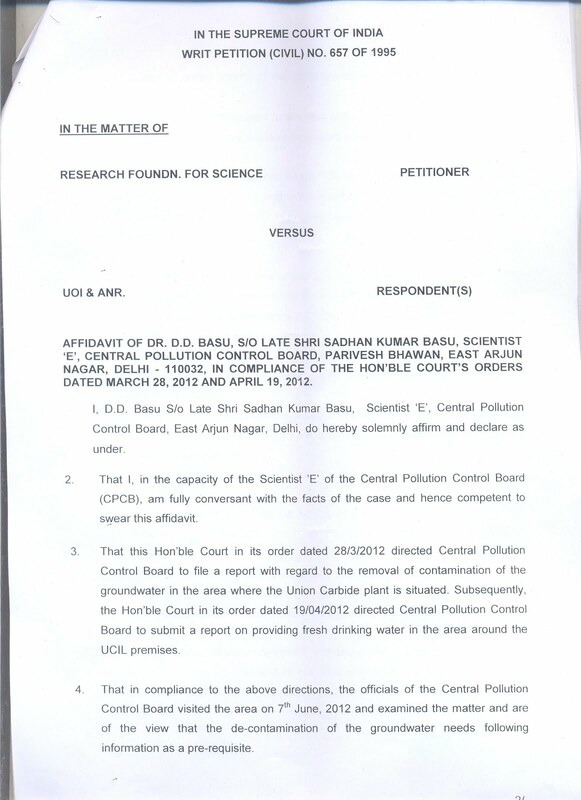 I submit that the Hon'ble Court had asked for "report with regard to the removal of contamination of the ground water in the area where Union Carbide factory/plant is situated" instead an irrelevant "Report of Drinking Water Sampling At Arif Nagar (Near UCIL Premises) Bhopal" has been filed. I submit that the title of all the 3 tables which are annexed as part of the affidavit is faulty, misleading and factually incorrect. Table 1 at page 11 is titled "Analysis results of ground water monitoring carried out by Central Pollution Control Board (CPCB)". The fact is the affidavit itself reveals that CPCB did not undertake the ground water monitoring as it has been 'commissioned' to IITR which in turn has sought the assistance of BGTRRD. Table 2 at page 12 is titled "Analysis results of ground water monitoring carried out by Madhya Pradesh Pollution Control Board (M.PPCB)". Table 3 at page 13 is titled "Analysis results of ground water monitoring carried out by Madhya Pradesh Pollution Control Board (M.PPCB)". The fact is at page 9 of the affidavit it is incorrectly claimed that "Groundwater sampling was carried out at six locations by Central Pollution Control Board (CPCB) and Madhya Pradesh Pollution Control Board (MPPCB)." I submit that at page 5 of the affidavit the six locations from where water samples were taken on June 7, 2012 between 3 PM to 6 PM are mentioned. It is explicitly mentioned that 5 of these samples were from "Drinking water supply by BMC", there is just one sample from Borewell in Street No. 8 being used by Ayasha Hotel at Arif Nagar, Bhopal. I submit that the content of the tables and its title needs to be examined and set right. I submit that it is evident from the affidavit of the CPCB that its team visited UCC's factory site after the expiry of the Hon'ble court's deadline. 1 Ortho dichlorobenzene, 2 Carbon tetrachloride, 3 Chloroform, 4 Methyl Chloride, 5 Methanol, 6 Mercury, 7 Sevin, 8 Alpha Naphthol etc. I submit that UCC's chemical plant dealt with a multitude of organic compounds to manufacture the pesticide carbaryl (Sevin). Phosgene and Monomethyl amine (MMA) were the main raw materials involved in the process of manufacturing Methyl iso-cyanate (MIC), which in turn was used in combination with excess alpha-naphthol to produce Sevin. By-products like chloroform,carbon tetrachloride, MMA, ammonium chloride, dimethyl urea were all collected and recycled back to the process. I submit that toxic substances stored inappropriately inside the UCC's plant site are believed to have entered the soil and the ground water aquifer. It may be noted that the 1996 study of Indian Institute of Chemical Technology, Hyderabad showed the presence of Heavy metals(Cadmium, Chromium, Copper, Lead, Manganese Nickel andZinc) in wastes dumped within the factory. Naphthol and other volatile organic matter were also detected in the same waste. Leaching from these wastes cannot be ruled out. I submit that the UCC plant was in operation from 1977 to 1984. After the industrial disaster in December 1984, the factory operations ceased and the site was abandoned. It is clear that since no remediation activities ever took place, the pesticide products and their production intermediates serve as ongoing pollutants to the environment, in particular, the groundwater. I submit that a recent thesis titled "A Deterministic and Probabilistic Analyses of the Carbon Tetrachloride Contaminant Plume in Groundwater at the Former Union Carbide India Limited Factory in Bhopal, Madhya Pradesh, India" submitted to the Faculty of the Rollins School of Public Health of Emory University in 2012 attempts to describe the contaminant plume of carbon tetrachloride (CCl4) in the groundwater using analytical models provided by publicly the available software known as analytical contaminant transport analysis system (ACTS). It notes that CCl4 is known to have adverse effects on human health when consumed through the drinking water and is classified as possibly carcinogenic by the US Department of Health and Human Services (DHHS). The calibrated deterministic results show that concentrations of CCL4 do not exceed the U.S. EPA maximum contaminant levels (MCLs) roughly 850m from the source in the northeast direction. Probabilistic simulations show that there is a 100% probability that CCl4 concentrations exceed WHO specified MCL up to the year 2034 at sites 500m, 1000m and 2000m northeast of the UCIL site. It may be noted that within the NEERI report from 2010, the direction of groundwater in the region of UCC's plant is reported to be in both the Northeast and Southeast direction. The Greenpeace report from 1999, citing an earlier report by NEERI, stated that the direction of groundwater flow is along a Northeast axis. The thesis states, "Given that the contaminant concentrations used for calibration increased along the Northeast axis, it was assumed for the purposes of this study that the direction of groundwater flow was along the Northeast axis." I submit that Greenpeace International's 1999 study had found Chloroform, Carbon Tetrachloride, Tricholroethane, Tetrachloroethane, Hexachloroethane,, Chlorobenzene, Dichlorobenzenes and Trichlorobenzenes were detected in the groundwater by Organic Screening Analysis. Concentrations of Chloroform, Carbontetrachloride, Dichlorobenzenes and Trichlorobenzenes in groundwater exceeded WHO standards at Bhopal's JP Nagar and Atal Ayub Nagar. In such a context, the submission by the CPCB official is manifestly quite inadequate. In view of the above, I urge you to kindly ensure that the CPCB's affidavit is recalled, revised and a fresh affidavit is filed at the earliest. Since its inception in 1994 Hotel Ganpati has established an enviable refreshing for refreshing Hospitality, and personalized service . lts prime location & excellent business services make Hotel Ganpati hotel in Bhopal the favorite among business travelers : A Home & office away from Home & office. Singularly committed to provide a touch of excellence & business ambience to its guests.